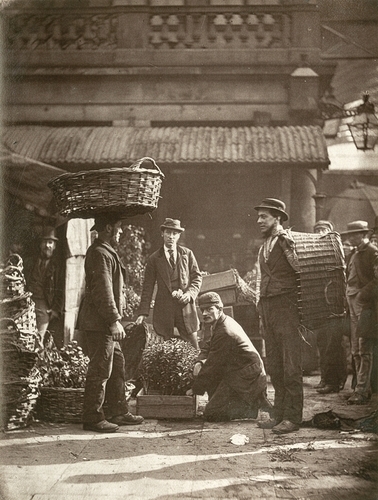 "The accompanying photograph represents a group of labourers who are in the service of Mr. Dickson, the well-known florist. Their business is strictly limited to flowers, and they never touch either vegetables or fruits. Nevertheless I am informed that there are five hundred flower stalls at the wholesale flower market, and, at a rough computation, two thousand men are engaged to bring and grow stock for these stalls; while another two thousand men find employment in distributing the flowers to their various purchasers. Only a small proportion of these latter are seen at Covent Garden during the daytime; it is in the early morning that they congregate on this spot, and they are soon scattered again to all parts of the metropolis, laden with plants of every description."